The phrases “100% disabled,” “permanent and total VA disability ratings,” and “total VA disability rating” get thrown around a lot in Veterans disability benefits claims. Problem is, that phrase doesn’t always mean the same thing to everyone. In fact it can mean several different things in at least 5 different types of service connection claims. Let’s see if we can clear some of the confusion up. 5 things many Veterans don’t know about Total VA Disability Ratings. 1) There are MANY paths to a 100% rating. Total (100%) disability ratings will be assigned “when there is present any impairment of mind or body which is sufficient to render it impossible for the average person to follow a substantially gainful occupation.” 38 C.F.R. § 3.340(a) (2013). * Total VA Disability Based on 100% Schedular Rating. When the Veteran’s service-connected condition meets the 100% impairment rating requirements found in Table 4 of 38 CFR, they receive a 100% schedular rating). * Total Disability Based on Schedular TDIU (When a Veteran has one service connected condition at 60%, or a total rating of 70% with one being at least 40%, the Veteran can request a 100% schedular TDIU rating). * Total Disability Based on Extra-Schedular TDIU. (When a Veteran is service connected for one or more conditions, but is not able to secure substantial gainful employment, he/she can seek an extra-schedular TDIU rating of 100% even if their ratings don’t reach the schedular TDIU requirements above). * Temporary Total Disability based on hospitalization (generally speaking, this is awarded when a Veteran is hospitalized for a service-connected condition and for the 6 months following that hospitalization). Don’t confuse these PATHS to a 100% rating with the designation that a veteran has “permanent and total disability rating.” A lot of veterans spend a lot of time trying to get to this designation, and while I’m not discouraging it (quite the contrary), it is an end state, not a path. So, for example, a lot of veterans email my law firm and ask to hire us to get a “permanent and total disability rating.”You do NOT need to have a 100% rating to get a permanent and total VA disability rating. This type of rating only happens when a veteran has no chance of recovering or improving from their disability – it protects them from a reduction. So, if your goal is to get your VA disability properly rated at 100%, focus on getting that rating. Then focus on showing the VA that there is zero chance that you will recover or improve from that level to get the permanent and total VA disability designation. 2) A Claim for Increase is also a claim for TDIU when there is evidence of unemployability. In the Rice v. Shinseki case (22 Vet. App. 447, 454-55 (2009)), the Federal Circuit held that a Veteran’s request for a higher disability rating, coupled with evidence indicating that the Veteran’s ability to work was “significantly impaired” by his or her service connected conditions reasonably raises the issue of entitlement to TDIU as an alternative basis for increased compensation. This type of claim is an inferred claim and should be considered by the VA Regional Office whether the Veteran specifically asks for it or not. What does that mean in practical terms? Depends on where you are in your case. When FILING a claim for increase, if you are unemployable because of the service-connected condition – regardless of the percentage, include VA Form 21-8940 and specify that you are seeking TDIU in addition to the claim for increase for that condition (include all service-connected conditions that impact your ability to get and keep substantially gainful employment). When arguing that the VA wrongly denied a claim, look in your C-File for claims for increase where you also alleged you are unemployable or unable to get employment because of that condition, and then you could argue that the TDIU claim is reasonably raised by the record. We are arguing the opposite in a case currently before the Board of Veterans Appeals – that a claim for TDIU, being a claim for increase, necessitates that the Board adjudicate the increased compensation claim as well as the TDIU claim. NOTE: Don’t confuse the concept of unemployability with unemployment. This is a common mistake, and one that the BVA makes far more often than it should. Unemployability means the ability to get and keep substantially gainful employment. Unemployment is largely irrelevant to a TDIU claim – in fact, veterans can still work and collect TDIU. 3) Extraschedular TDIU is NOT an Extra schedular Rating. Adding MORE confusion to the mix, there are 2 totally different types of “Extra Schedular” ratings. The first is a 38 CFR 3.321(b) Extra Schedular Rating. This is available “in exceptional cases where the [normal schedule of ratings] is inadequate.” Thun v. Peake, 22 Vet.App. 111, 114 (2008), aff’d sub nom. Thun v. Shinseki, 572 F.3d 1366 (Fed. Cir. 2009). The second type of extra-schedular rating is “Extra Schedular TDIU”. A key difference – but not the only difference – is that Extra Schedular TDIU requires evidence that a Veteran is unemployable, but does NOT require proof that the Veteran is inadequately compensated by the normal schedule of ratings. a 3.321(b) extra schedular rating has nothing to do with unemployability – you merely need to prove that the normal Schedule of Ratings does not adequately compensate you for your service-connected disability. 4) The VA will deny your claim for TDIU – administratively – if you don’t file the 21-8940. I see this happen SO much. Veteran claims unemployability or TDIU, and the VA actually catches the inferred claim. They send a letter saying – essentially – send us a copy of VA Form 21-8940. The Vet never sends it in. The VA has an internal policy of an administrative denial of a request for TDIU if the Veteran fails to send in VA Form 21-8940. And they usually don’t give a second warning. If your request for TDIU was “administratively denied“, what can you do? 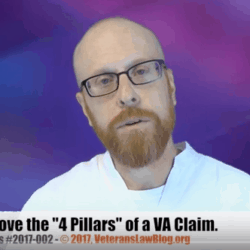 Send in the VA Form 21-8940 within a year of the VAs request for the VA Form 21-8940, and your claim should get processed properly (knowing full well that the VA rarely does what it should). Take a look at 38 USC 5103(b)(1) for the authority on this. 5) The VA will NOT give you an exam for a TDIU claim unless you specifically identify the medical condition that led to the Unemployability. Hell, they may not even give you the exam anyway. But the important point to note, here, is that you should list on VA Form 21-8940 every single medical condition that is, or that you believe should be, service-connected that you believe plays a role in rendering you unemployable. They may not give you a CP exam on each of those conditions – but at least you’ve laid the groundwork for arguing later that the VA failed to fulfill its Duty to Assist if it denies your claim. And, by the way, in about half of the cases where the VA says that the Veteran never submitted a VA Form 21-8940, I’ve found that they have already submitted at least one copy of the Form. How do you find out if you submitted one and the VA is just not seeing it? 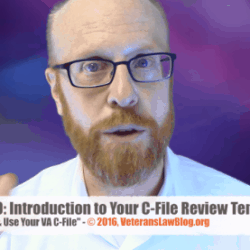 Get a copy of your C-File: it’s the most important document in your VA Claim. And check out the TDIU Field Manual and TDIU training package at the Veterans Law Blog store. Because they almost ALWAYS overlook the “inferred” claims of TDIU and Special Monthly Compensation. Did you file VA Form 21-8940, or did you mention in your PTSD claim that you were having difficulty earning an income due to your PTSD? Email me at support@veteranslawblog.org and I can give you more direction on the path/process to look into. Great site. I had a TKR on left knee which was rated 10% for 49 years. Got the 100% for 13 months. July 1 2015 I had revision surgery to replace the plastic spacer and stop the bleeding. Filed a claim for 3 months of temp 100%. VA said operation wasn’t needed and said no to my claim. Plan to file again. Any other suggedtions? Out of curiosity, why would you refile instead of appealing the denial? am also 100% disabled through SSDI. Jan 2012 is when I filed claim. Sent a NOD through my VSR (where I live VSR is part time Monday/Wed). I received a denial letter dated 24 Aug 2015. I have not worked, nor been able to work since Apr 2011. Any help would be appreciated. If you are disabled through SSDI for the same conditions that are service-connected, at those percentages, it sounds like you might be eligible for TDIU. Did the August 2015 Ratings Decision talk about TDIU? Did your VSO file for it? I have seen other information on your site about using a “Sworn Declaration” instead of VA form 21-8940. Im not sure if I need to file this form or the other. If you are granted Social Security Disability for a medical condition you claim as service-connected (or that has been previously) service connected, the Social Security AJ’s decision is pretty powerful evidence of entitlement to Total Disability based on Individual Unemployability (TDIU). Very interesting!! I was a Service Officer for the American Legion and have a small idea of the VA, but I think its time to be represented by someone who has the true knowledge. I am currently 60% and much worse then that. I can not be employed and make a decent living and when I think, I am only 10% away from being unemployable.